Somewhere off the coast of Alaska and never happier. A friend recently asked me why I love going on cruise vacations. She expressed some of the fears I had before I took my first cruise vacation. Won’t you feel trapped and claustrophobic? The short answers are no, no, and sometimes! But honestly, after three cruises I can say I’m a cruising addict. So I thought I’d address some of these questions based on my own experience. Cruising is not for everyone and only you can decide if a cruise vacation would be right for you, but here are my answers to some popular cruise ship myths. Won’t you get bored being on a ship for that long? First of all, on a typical 7 day cruise, you probably will only have 2 or 3 sea days. Sea days are just what they sound like: days you spend entirely at sea, without any stops in ports. On sea days, you can’t even imagine how much there is to do on a cruise ship. During the hours of around 6am to midnight, there are simultaneously several activities happening. If you don’t want to participate in any of the activities, you can go read a book or play a card game in one of the several public lounges. If you have a cabin with a balcony, you can sit outside and watch the water go by (more interesting than it sounds). And of course there’s the food. Feel free to have 4 or 5 good meals a day. And in between meals you can spend time in the fitness center or on the jogging track. Bored is one thing I have never been while on a cruise ship. I am one of those people who feels claustrophobic on airplanes and crowded elevators, and I am telling you that you won’t feel trapped on a cruise ship. Most people picture a little boat bobbing around in the ocean, which is so totally not reality. You can’t really fathom the massive size of these ships until you get on one. I can imagine a family of four in one of the windowless cabins can feel a little cramped. But in the common areas of the ship, it feels like wide open spaces. I’ll give you a similar disclaimer as above: I am very sensitive to motion. I can’t go on Space Mountain or Star Tours without taking Dramamine. So sea sickness was a very big concern of mine and actually kept me from cruising for a very long time. But it seemed like I was missing out on something really fun so I decided to stock up on some sea sickness essentials and give it a go. I’m not going to lie, you do feel the ship moving but it’s nothing like being on a tiny boat. On calm seas, it’s a slow rock from side to side. Before my first cruise a friend told me the motion rocks you to sleep, and she was right. It’s unsettling at first but after a while you don’t notice it. When the ship is speeding along in open ocean, the waves get a little rougher and you can feel the motion a lot more. If you happen upon some bad weather, it’s going to get rocky. This is unusual but it does happen. The part of the world you are cruising in can also affect the motion of the ship. The Mediterranean Sea and the Alaska Inside Passage is protected from the open waters and it was like sailing on glass. Hardly any motion at all. Sailing out of Florida to the Bahamas or Caribbean, it is well known there is a current you cross through that shakes the ship up a bit. Where you are on the ship can also affect how much motion you feel. Midship rocks less than the Forward (front) or Aft (back), which is why midship cabins tend to cost a bit more than their forward or aft counterparts. Also, the higher up on the ship you are, the more you’ll feel the movement. So, if you’re feeling unstable, try going to the ship’s atrium, which is usually midship around Deck 4 or 5 or 6. Being outside also seems to help me with motion sickness, which is why a balcony cabin is handy. If you don’t have a balcony cabin, there are plenty of outdoor common areas. Going outside and watching the horizon and feeling the cool ocean breeze on your face seems to minimize the motion. As far as counteracting the feeling of motion, whenever I cruise I wear (affiliate link) Sea Bands. They are pressure-point bracelets that you wear around your wrists and I swear by them. I bought them for cruising but now I wear them on airplanes, long car rides, or anywhere else I may have trouble with motion sickness. I read they also can help with morning sickness or the effects of certain medications like chemo. You can get Sea Bands at any drug store like CVS or Walgreens, or on Amazon. Along with the Sea Bands, I carry ginger pills with me. If I start to feel unsettled, I’ll pop a ginger pill and I usually will feel better. If the motion is more intense, I’ll take a Dramamine which usually puts me to sleep. During the four cruises I have gone on, I’ve only had to take Dramamine one time. What about Norovirus or some other type of illness spreading through the ship? It’s true this can happen but it’s pretty rare. Most people are reasonable and won’t get on a cruise ship if they have a serious illness. And there’s hand sanitizer EVERYWHERE. Use it. There are even crew members stationed at the gangway to spray guests hands as you come back from port. And if you do get sick, every ship has a medical station with a medical staff to treat a wide array of illnesses and ailments. If you have a contagious illness, you’ll be ordered to stay quarantined in your room for at least 48 hours. The rule makes vacation less fun, but helps prevent a widespread outbreak. Aren’t you worried your ship will lose power and get stuck in the middle of the ocean, or run aground like that one ship? No. This is even rarer than Norovirus. This, like, practically NEVER happens, because if it happened often it wouldn’t be headline news. So no, I’m not worried about either of those things and you shouldn’t be either. Still nervous about taking a cruise? I’d love to answer any questions you have! Awww … well I’m assuming a cruise ship is nothing like working …. and maybe you can tell him it’s not about the ship but the ports/destinations?  Good luck! We actually did lose power for about 2 hours on our last cruise. It wasn’t so bad. We just went and hung out by the pool. Shrug. All of your advice is sound. We are totally addicted to cruising and can’t wait for our next one! Oh interesting! Did you actually stop moving? I was thinking more along the lines of when the Carnival ship had a fire in the engine room and lost power and had to be pulled to shore. I love cruises – you get to see so many places without having to take time out to fly/drive or switch hotels! Also, it’s SO much more cost-effective than almost any other type of travel. 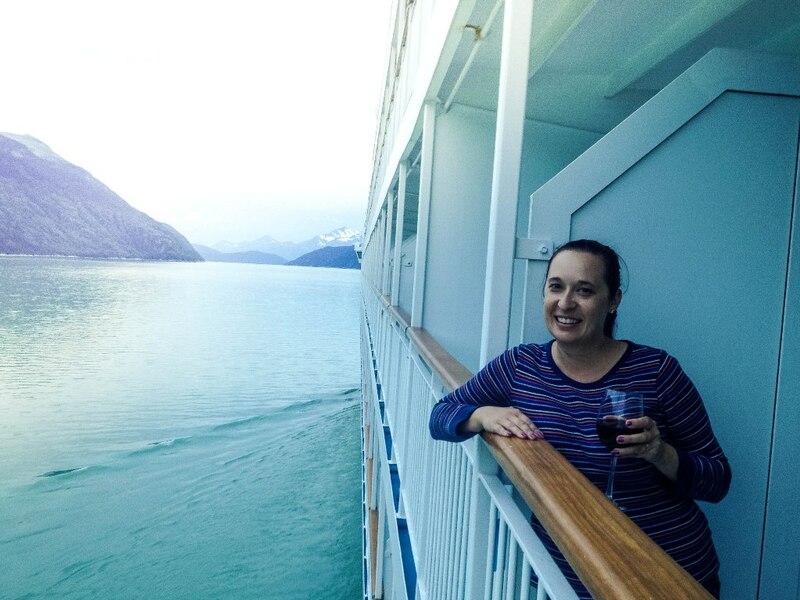 Our cruise to Alaska got VERY choppy (like, even the crew was sick) due to a storm, but they were able to maneuver the boat into protected water for most of the journey. Other than that, I popped a dramamine (but fell asleep immediately) and kept Trader Joe’s dried, sugared ginger pieces with me. It seemed to help, and it tastes pretty good, too. I’m so excited for our next cruise – it’s going to be on one of the new Disney ships! I’ve never been on a Disney cruise, and I can’t wait! You care going to LOVE the Disney cruise!!!! The Alaska cruise was the one time I had to take Dramamine, and it wasn’t exactly a “storm” but it was raining and the waves were “large swells” according to the bridge information channel. Hubby wasn’t bothered by it at all but I had some trouble. Ahoy Capt. Mindy! Look at you being such a Cruise expert!  I enjoyed your article today and think it answered some of my concerns. I do think that a cruise is the only real reasonable way to travel to some destinations and I think it’s great that you’ve taken advantage of that and have been to so many interesting places thus far! A cruise ship made it possible to visit Spain, France, Italy, Greece, and Turkey all in one trip. I can’t even imagine trying to plan all that on land!!! Hi Mindy, I ❤️ your blog! I just wanted to point out that (on Disney ships, at least), meclizine is available for free from Guest Services as well as the Medical station — and, it’s chewable OR swallowable! You bring up a great point! I always bring my own, but yes, most ships will have medicine available at guest services or to buy in the gift shop (if you think you will need a lot). Thanks for adding that tip, Max!